Newly completed by Akers Custom Homes, this residence offers 4,479 square feet throughout four bedrooms, four full and one half bathrooms. Overlooking Holes #3, #4 and #5 of Lake Nona’s championship golf course, this home features spectacular golf and water views. 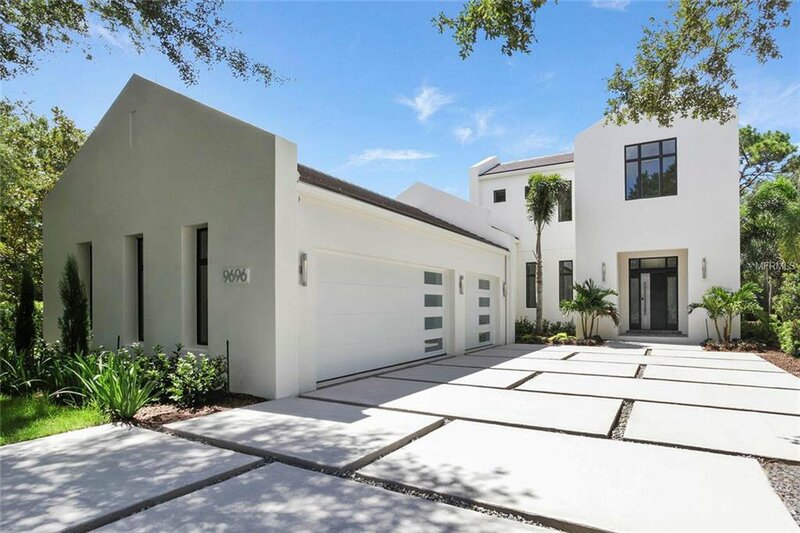 The contemporary aesthetic of the home’s exterior is balanced by transitional interior architectural features that impart character and modern charm throughout the welcoming floor plan. Porcelain tile floors are complimented by sleek metal and glass light fixtures which illuminate this custom-designed home. The modern kitchen consists of a walk-in pantry and Miele appliances including a separate double refrigerator and freezer, three ovens – steam, speed and convection – and a six-burner gas cooktop with hood. Anchored by an eat-in center island, the kitchen opens to the dining and living rooms, which overlook breathtaking golf and water views. Sliding glass doors open from the great room to the courtyard, pool and spa. The outdoor living area is positioned around a stainless-steel fireplace and is outfitted with retractable screens and a summer kitchen which gives flexibility to enjoy the outdoor area in any climate. Encompassing the best views in the house, the master suite enjoys a beautiful master bath with dual sinks, a floor-to-ceiling glass shower, a free-standing tub and a generous master wardrobe. Additional features include an elevator, downstairs guest suite, powder pool bath and a three-car garage. Listing courtesy of LAKE NONA REALTY LLC. Selling Office: PREMIER SOTHEBYS INT'L REALTY.